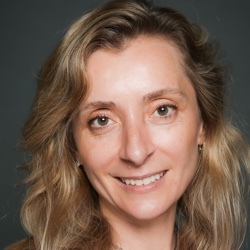 In the last two decades Oana Bogdan has worked on dozens of movie and TV productions. On the big screen her career spans “Stargate”, “Godzilla”, “Vanilla Sky”, “I, Robot”, “Underworld”, “Total Recall” and the upcoming “The Prey”. On the silver screen you have seen the her work in “24”, “Without A Trace”, “Cold Case”, “Criminal Minds”, “Justified”, “Dark Blue” and “Hawaii 5-0”. In this interview she talks about how the craft of art direction and production design is changing in the world of increasing capabilities of digital tools, the shifting balance of responsibilities between the various departments, why building real-scale vehicle models was necessary for “Total Recall” and how different the work like is between movies and TV shows. Kirill: Please tell us a little bit about yourself. Oana: I was born in Romania and moved to the US when I was 8 years old. I got into the film industry in 1993, I had just moved to LA the year before, and my first project was “Stargate”, the one that Roland Emmerich directed with James Spader and Kurt Russell. The film industry has definitely changed a lot over the last 20 years. At the time, “Stargate” was a pretty big show, and surprisingly, it was a non-union project. It was pretty easy to get into the film business, I think, in those days. I ended up working in the creature department even though my initial contact was in the art department. I had a very nice meeting with the art director, Mark Zuelzke, who then thanked me and told me that he was not going to hire me! He told me to call this other person on the project because he was also looking for some help, and that’s how I ended up in the creature department on that film. The designer and fabricator of the creatures was Patrick Tatopoulos, and I ended up working with him for the next eleven years. He went back and forth between production design work and creature effects work, and I got the chance to work in both of these departments along the way. Kirill: Looking back to those earlier years, how was the process of bringing creatures to life on film? Did it involve more physical craft than it does today? Oana: Yes, actually, effects were typically made practical at that time and the majority of the effects we created for the film were practical and in camera. Stargate was revolutionary at the time, we developed a new technology for the visual effects with the stargate ring, where the characters would pass through the ring using an optical effect to get to the parallel world. It looked as if they were passing through a vertical plane of water. We also had helmets that we constructed for the creatures, Anubis and Horus, the guards and Ra that needed to retract back from their faces. We had physical helmets created, and through visual effects morphed them digitally to reveal the heads of the actors. That was the beginning of digital effects as we know them now. Kirill: How has that evolved over the last couple of decades? Oana: I find there’s a still a need for practical effects, and it also depends on the director you’re working with. I worked on Total Recall with director Len Wiseman who really believes in having physical effects on the set. Yes, you’re going to need to have the CG, but it’s better to start from something that’s real, a real object that you’re photographing that reacts and interacts with lights, atmosphere and actors, and then enhance it with CG. That was Len’s thought process. When he directed Underworld, we built the creatures (werewolf suits, vampire makeups) practical to begin with and then enhanced them with CG as needed. So it depends on the script and the budget you get for the film, the scope of the creature or character, what is it going to do, what is its performance, and can you achieve that practically or not. Some of this is determined within the design of the creature/character, so the design will take into account a performer inside a suit for example, and if the budget allows, we make it practical. Most of the projects I’ve worked on have allowed us to build something practical. Kirill: Such as for I, Robot for instance? 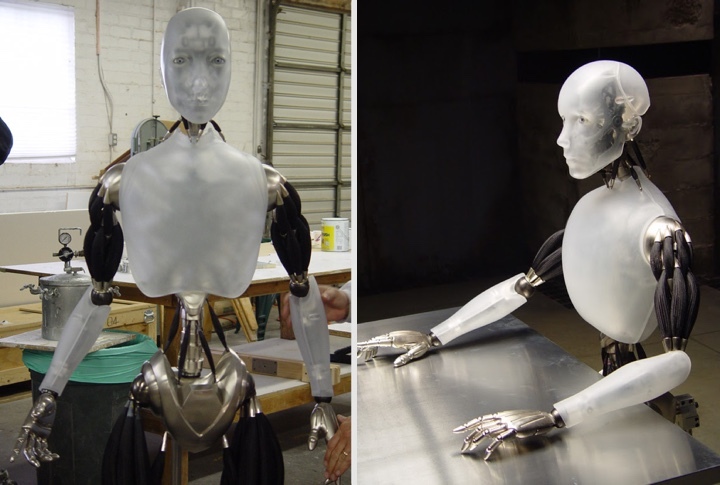 Oana: For I, Robot it would’ve cost too much money to try to make the robot animatronic, to make it radio controlled to move for a performance. But we did make two posable lighting dummies (2 mannequins) and when they filmed the scenes with Sonny (the robot character) they did three passes every time the robot would be in scene. 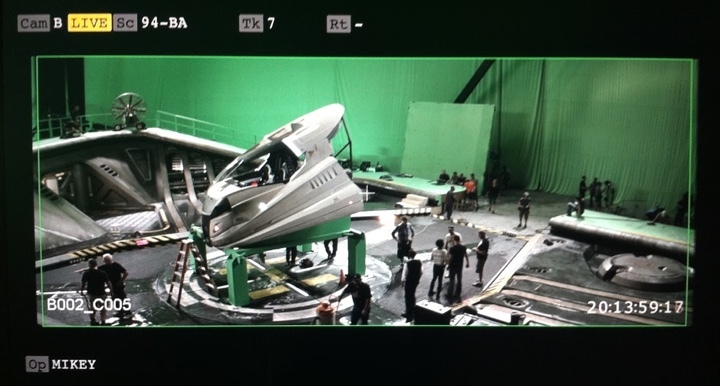 There was a pass with an actor (Alan Tudyk) in a greenscreen suit for the robot’s performance, a pass with a clean plate to remove the greenscreen suit, and a third pass with the lighting reference in the position – to know where the lighting should be on the robot when they got the footage months later in the CGI compositing room. That was a very interesting way to approach it. Kirill: And then for Total Recall the director wanted actual full scale vehicles for the highway chase sequence, to have a real physical impact on the actors, to create a believable physical environment. And you had to make these models to mount on top of go-kart rigs. Oana: Absolutely, that’s one of the reasons why director Len Wiseman insisted on building these cars for real. 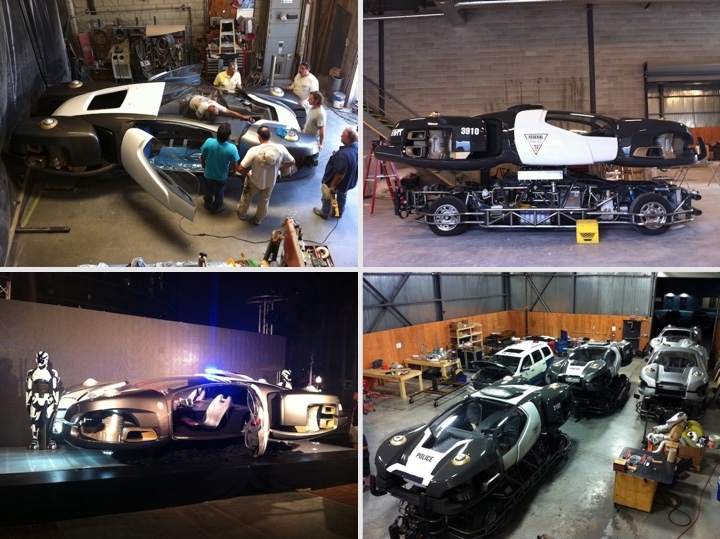 We ended up building five hover car prototypes, we painted 3 as police cars and two as civilian cars. We built five motor driven chassis as well that were essentially drivable motion bases for the hover cars. We built the hover cars (the beauty pieces up top) to stay in the picture. And the other pieces – the chassis would be removed in post while the cars were being composited into the digital background of the streets of the “United Federation of Britain”. In practical terms, the chassis were controlled by two stunt guys, one to steer the front wheels and accelerate, and the other to steer the rear wheels and control the motion base of the car, so that you could have the hover car mounted above spinning around and tilting side-to-side, front-to-back. The actor inside the hover car above had no control over the vehicle at all, his only requirement was to act as if driving and interacting with other cars on the road. The chassis were quite large, and I would say they resembled a dune buggy on steroids, more so than a go-kart rig! Kirill: And even though these are not real hover cars in the sense that we don’t have the actual technology, you’re still creating them to have the right weight mass and weight distribution to act believably as they are driven around, something tangible. Oana: Each hover car had a subframe made of steel and welded together. 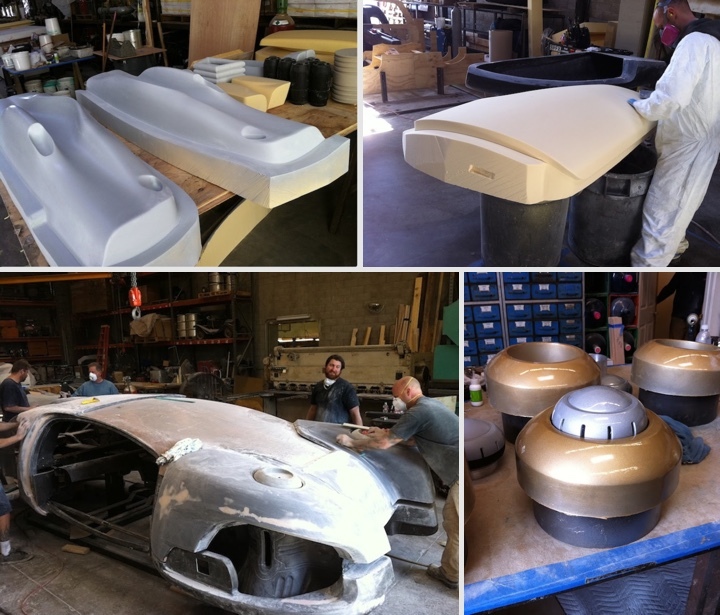 For the bodywork, we had the computer models fed to CNC routers, carving pieces out of foam, then cleaning them up, molding, and making fiberglass shells to assemble onto the framework. For all intents and purposes it was a frame with a fairing for a car, with practical doors, a dressed out interior and a few moving parts inside the cabin that needed to be practical for the filming. The 3D model that we designed then generated for the practical build also went over to the CG department for them to animate. And even after we had the cars built, VFX came in and did a LIDAR scan of the car on the set – remapping the whole thing within its environment. Kirill: What about the physical damage inflicted when the cars bump into one another? Were you constantly fixing and rebuilding the outer shells? Oana: There was a bit of patching going on, absolutely. We had some bandaids that we created [laughs]. It was heavy vinyl that was painted the same color, and if they did get a bump or a scratch, we could touch it up relatively quickly. We had the paint department standing by with us every day the cars were filmed. If we had a break in the filming schedule, the cars were being re-painted and touched up for the next shoot. We scheduled the filming in such a way to do the clean scenes first, and the crash and the rolling car at the end. So in one of the very last scenes we shot with the cars, we actually rolled one of the hover cars off the back of a tow rig. We built a cage around it, designed to contain the damage, let it loose off the rig, and it looked fantastic. By the end of filming the five hover cars were pretty trashed! So we sent five of them to set to shoot in Toronto, and then we made number six to go to ComiCon for a publicity display. That car had a slightly different framework since it didn’t need to be mounted to a chassis but the outside was identical to the other cars. That one might probably still be around somewhere, if they need to take it and show it. The completed hover car models. Kirill: Is it satisfying to create something physical, something tangible? There’s this half-stated promise of CGI to be able at some point to push a few buttons and create a complete environment that you can imagine, all in a virtual world. Oana: There’s something so much more satisfying in having something tangible, something that you can touch. I’m personally a big believer in that. I know everybody has switched to designing digitally, and there are definitely big advantages to it. Another thing that I’ve done in response to this “digital process” is to open a small business four years ago in Santa Monica, which is a fine art painting studio called PAINT:LAB. I think people need to still connect with that tangible part of themselves in creating artwork. And there’s nothing like having a brush in your hand and putting paint on a canvas. Yes, you can do it on a computer with a mouse, or your Wacom tablet, and you can have unlimited ‘undos’ and all the other fun stuff, and you can print it out – but where is the original? 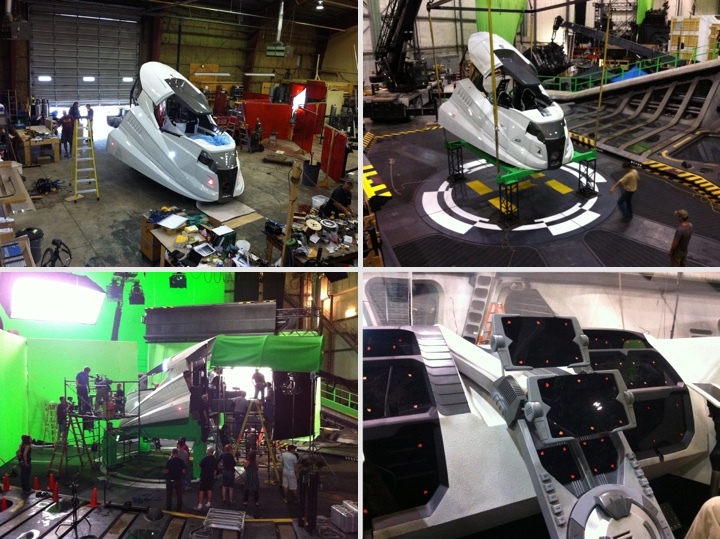 So back to hover cars… for these vehicles we had to design and manufacture every bit of them. The left fender, the right fender, the lower fender, the mag-lev engine dressing, the whole interior of the car with steering wheel, the buttons, the dashboard, the foot pedals, the throttle, etc. Kirill: What about the helicopters? In the hover car chase it looked to be all CG, kind of being there in the background. But in the second half, as they go out to the radiation zone and fly back to the top of the gravity elevator, the helicopters become a big part of the physical environment. Oana: To give some background on my role at Total Recall, I stepped in about halfway through the process of the car manufacturing, replacing the previous art director. I came in to finish it, so I can’t say I was there from the beginning of the cars. And the cars were great, stepping in, picking up the pieces, figuring out the puzzle and finishing it out. I didn’t have as much influence on their design or look. The helicopter however was just a concept when I started. We were able to build the interior of the cockpit and the exterior shell comprising about a quarter of the outside fairing with the glass canopy while the rest of it was CG. And on that one, really from the ground up, I worked with the production designer, director and a very talented vehicle designer/modeler to come up with the final design of the helicopter. We detailed the whole interior of what that cockpit would look like. We had to keep within a budget as well. For example, custom fabrication on the seats was going to be very expensive, so an interesting thing that we did was to find an unusual looking race car seat to use for the interior. We purchased four of them and then designed and built the shells around them to hold these race car seats in place and make them look integrated into the rest of the helicopter. All of the dials, gadgets and ‘heads up’ displays were designed from scratch and each button was designated for a function in advance. 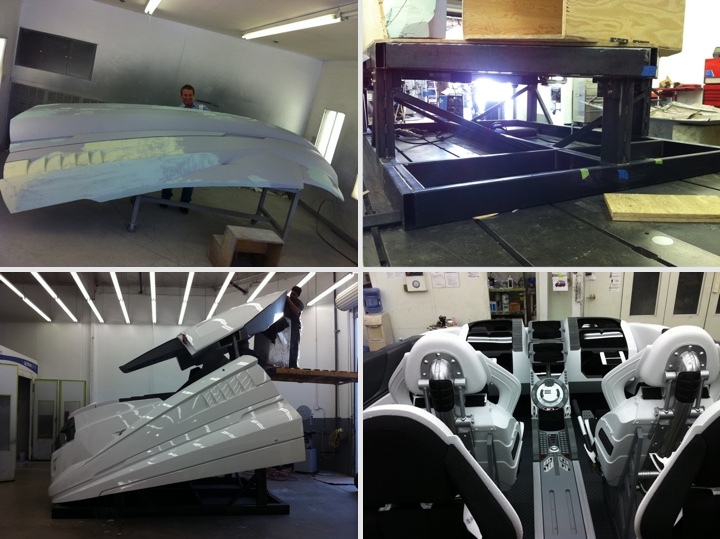 It was a similar process for fabrication, we modeled it and then sent out the model to a company who output the parts and the finished paint job. After delivering the helicopter to Toronto we added a few more details and the exterior lighting as well. The helicopter cabin on set. Kirill: How big was the part that you’ve built? Oana: We built about 1/8th of the entire craft. It was about 12 feet wide, and about 20 feet from the front end to the back end, and about 12 feet tall. It was the front cabin of the helicopter. Originally, it was not supposed to be damaged in the story, until they rewrote the ending [laughs]. We ended up damaging the windshield for the filming, we cut it up to look like it had shattered and added bullet holes in it, and we had the helicopter up on a flying rig. We rigged it to lift off and made it look like it crashed on its side. Of course it was supposed to look like it got damaged, but everything was controlled so the damage had to be pre-set. Even the car damage was calculated – how we were going to crash them into each other. Kirill: How much time does it take to create the physical objects on that scale? Oana: From start to finish, this project took me 6 months to complete. I joined during the pre-production stage, working on the cars for about four months, and my predecessor worked on them for four months as well to design and develop them. We delivered them in July and I started around April. The helicopter had a much shorter time frame since there was less complicated engineering involved and we were able to fabricate it in 2 months. The cars needed to be designed and engineered to fit with the chassis, also designed and built from scratch. We were building the motion bases at the same time and it took quite a bit of time to coordinate the three aspects and to complete them. Kirill: Did you like the amount of screen time the helicopter got? Oana: In the initial script version that I read the helicopter had less screen time. Once we delivered the craft Len really liked it and he decided to add more action and more filming days using the helicopter – so Yes. In the end it was a big part of the action, used by Quaid and Melina in the attempt to escape from the destruction zone. Kirill: When do you get a chance to see a full sequence that blends the physical parts with the CG extensions? Oana: Occasionally, depending on the project, I’ll get a chance to see dailies while we are filming. On Total Recall I ended up coming back a few weeks before it was released to build some sets for re-shoots and to change some graphics for parts of the film that were rewritten. That was a lot of fun and I got to see some of the film at that point before it was released. Kirill: Are you asked to provide detailed technical specs or some physical pieces for long-term archival, preservation and restoration purposes? Oana: All of the design and conceptual work created by the art department is archived by the studio for future sequels or restoration purposes. Sometimes the studio does hang on to the physical pieces of sets or props like the hover cars if they are interesting enough to them. 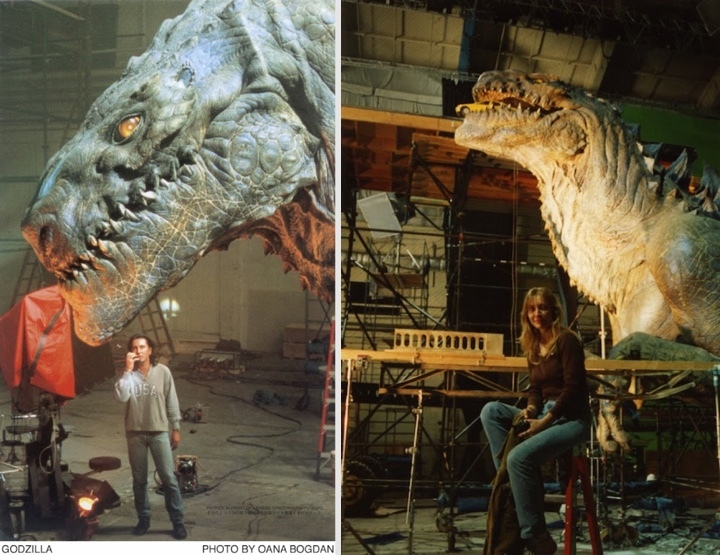 When I worked on Roland Emmerich’s Godzilla we built a 1:6 scale miniature from the waist up. This giant creature was still around 25 feet tall. After we built it, filmed it and finished the project, it got wrapped in a bunch of blue plastic tarps. It sat in a parking lot at Sony studios for three or four years, and every time I drove by the studio I could see the blue tarp sticking up over the fence because it was so huge. I would say to myself… Godzilla is still here, I can’t believe it [laughs]. Eventually they decided that they were not going to make another one and they got rid of it. Now they are making another one, but it will have a different design and Sony/Columbia pictures is not involved in this production. Kirill: Is there a lot of progress on the side of the equipment that you’re using? Anything related to 3D printers and how they make certain things simpler or less expensive? Oana: I think that 3D printers are great. Total Recall was the first time that I was introduced to them – around two years ago. We printed a lot of prototypes and actual parts used in the cars using that technology. I haven’t worked on anything that big recently that it would require using them, but i think they are a great tool and their prices are coming down to be much more affordable. I’m a really big believer in having a 3D object in front of you to see it and analyze it. You can always make a digital model using sketch-up or Rhino modeling software, and pull views and fly a camera through the model to see the space, but it’s not the same as actually holding a physical model in your hand and being able to turn it every which way to see all of the possibilities. When I started in the art department, we used to make 1/4-inch models of the sets, where you could stick a mirror periscope in and look through, look around and see what your eye-lines are going to be. Technology has definitely changed a lot of that, and we don’t spend the time to make practical models anymore. I’ve recently worked on a lot of TV shows and smaller-budget projects where we don’t have the luxury of time to make and look at the models in advance. On these projects our resources and timeframes are much more limited. Kirill: A few years ago Industrial Light & Magic has spun off its model shop division into a separate entity, and then that was closed for business. As more volume is moving towards digital effects, do you see fewer people coming into your line of physical craft? Oana: If you’re talking about ILM and filming miniatures, that’s gone away a lot. Creating environments digitally has gotten better. There’s one big thing that I’ve noticed about production across the board. Because of technology, people who are decision-makers feel that they can wait until the last minute to make their decisions. But when you’re making something physical, like a model, or building a set, you really need the time to plan it and build it. You can’t decide the night before that you want it to be different. On Godzilla we would build these cities in miniatures for Godzilla to interact with at correct scale. It takes weeks and months to get those buildings made. If you’re building it in the computer and you want to change a window in one building, you can decide at the last minute and somebody will still have time to do it. In a way, digital technology hurts the process of making tangible things. Kirill: Is there a certain balance shift towards doing more things in post-production? Is there even such a thing as post-production anymore? Do you feel that you’re losing some control over the final product because you’re not creating as much physically? Oana: There is a little bit of that happening in the art department in general unless you make sure that as an art director you get to stay on the show for the whole thing through post-production to control and influence the look of what CGI is creating. We’re so connected with technology right now that if somebody has a great idea for a change the night before something shoots and you have it built practically you don’t have time to react and make those changes. The computer guys will probably spend more time doing the same changes, because there’s infinite adjustability. Directors and producers used to plan things out a lot better, we used to make a plan and stick to it and make a product based on that. And the trend that I’m seeing now is that there’s a loose plan and we’re going to adjust on that day. That can make your work very frustrating! Kirill: Is that affecting the quality of the final product as the viewers see it on the screen? Oana: It just shifts where the attention is and where the money is going to get thrown at to fix things. Things have shifted hugely. When I started working in this business, we didn’t even have pagers yet. You had to call somebody when they were at the office to communicate with them. You had to go to a meeting with somebody face-to-face. You couldn’t just pick up your phone and ask them to change something because you just had this great idea. Kirill: Let’s switch to your work on TV shows. You’ve worked on Cold Case, 24, Criminal Minds, Dark Blue, Hawaii 5-0 and quite a few others. Is there more money in TV these days? Do you have more to work with these days? Oana: It depends on the studio. HBO probably puts a lot more money into some of their products. It’s case-by-case. TV in general has really come up a lot, as far as the look of it, the stories, what the viewers are expecting. One of the nice things in working on a TV show is that you have more time over an entire season. I’ve worked on Justified, and you have 13 episodes in a season, so you have 13 hours to develop those characters, to make an interesting story, to really get into the places and characters. If you’re doing a feature, you got two hours. You really have to do it quickly, to hope that your viewer will catch on and invest into who your character is. Most TV shows have repeating characters, even if it’s a standalone show. You can watch every episode of Criminal Minds by itself; it’s not a continuing storyline. The main characters are the same, and the sets are different, it takes place in a different city every week. I’m not talking about sets necessarily, but more about character development, and why are people tuning in to this show, who are they watching, what’s the story that they’re following? Kirill: Do you prefer to work on a full season of the specific TV show? Oana: It’s really hard to do just a couple of episodes. The best is when I can start a show from the very beginning and set up the art department the way that I would like it to run, to staff it with the people that I would like to have there to have the job done. That’s by far the best where you have that control over it. I’m currently working on Ray Donovan, and their designer left and the art director moved up, and there was a space for an art director. But when I came in, the show was already halfway done. I have to now learn how they’re running the art department, how they like to communicate with the other departments, to pick up the pieces and go from there. It’s similar to the way I did on Total Recall. Sometimes I feel they call me in to save the day [laughs]. There’s something wrong, let’s call Oana. Last summer I covered for the art director on 90210 whose wife was having a baby. He left for two weeks, and that was challenging to do. They already have their system, they know each other, and I have to step in and try to be helpful. 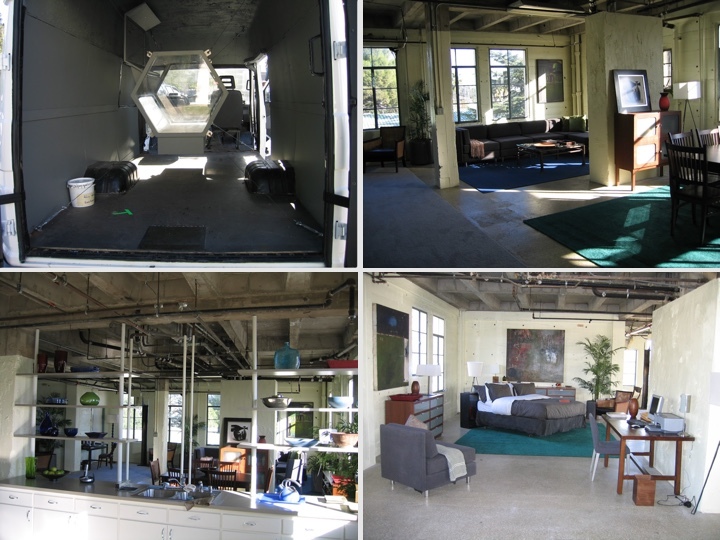 Various sets for “Criminal Minds”. Kirill: Do they even need you for a couple of episodes? Oana: When you’re on a TV show, here’s the crazy thing. You’re always doing two shows at once, one is filming while the other is prepping. 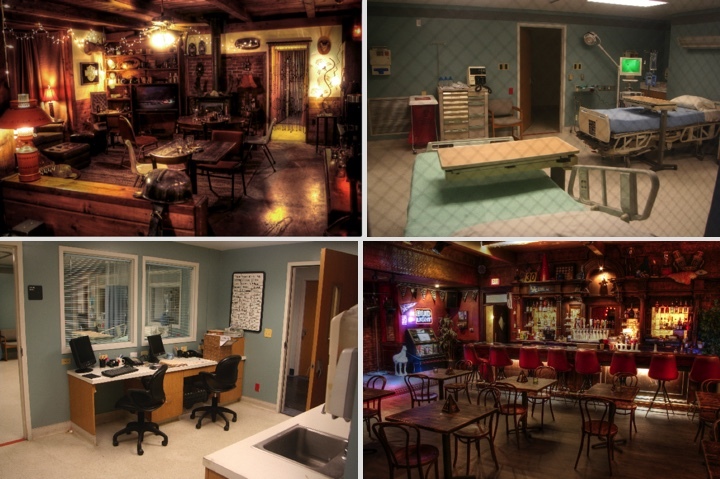 The art departments on TV shows are usually pretty small. There’s one production designer who takes care of all the of the prep, going around to scout the locations and making the design decisions. There’s the art director that supervises all of the construction and communicates with all the other departments. You might have a set designer who’s building and who’s drawing stuff that’s going to go to construction. You have the art department coordinator who’s making sure that the paperwork is done. And you might have a production assistant who’s running around and doing errands for you. If one of those people is not there, there’s a big hole. 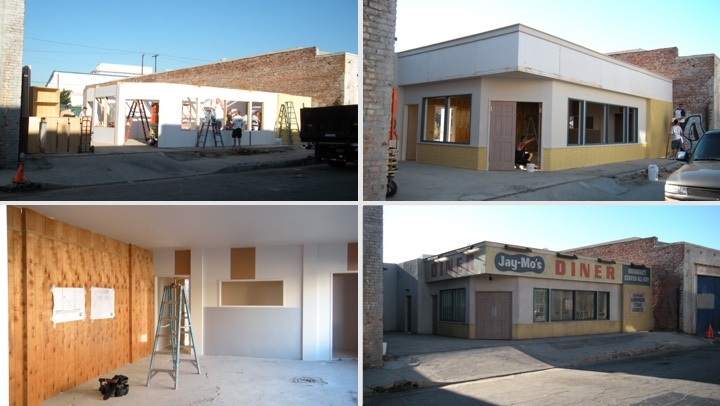 Building a diner set for “Criminal Minds”. Kirill: Isn’t the nature of a long-running TV show to not have the same crew season after season? You can start it, but do people stay on it for longer than a couple of seasons? Oana: Most people like to stay on their TV shows for every season that it’s on. 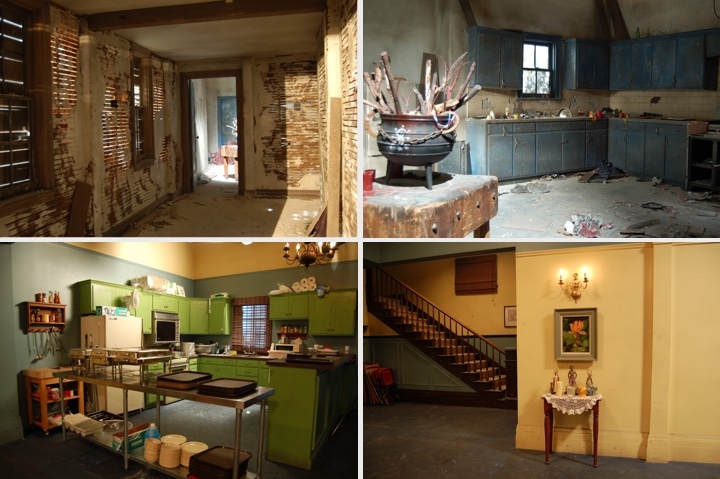 The Production designer of Criminal Minds has been there since the very beginning. He did the pilot episode, and they’ve just finished season 8. He’s going to go back, I’m sure, for season 9, and if there’s season 10, he’ll be there. One of the things people like in working on TV is that it’s consistent. They get to stay in LA, work in LA, and they can have a life outside of it, they can have their family. Typically on a TV show you will have the same cinematographer for the whole season. On Hawaii 5-0 we had two, and they alternated every other episode; but that’s not typical. Usually it’s one cinematographer who takes care of the whole season, and the look of the show as far as the lighting stays consistent. The directors, however, are always changing. There’s always a new director. The only show that I worked on that had the same directors all the time was 24. They had two directors that would alternate. They would do every other episode, and those directors were producers as well – Jon Cassar and Brad Turner. They were the mainstay directors, and once in a while they would bring one other person to direct an episode or two. Kirill: Do you want to continue alternating between movies and TV? Oana: Absolutely. I would prefer to work on feature films, and if I get called to work on TV shows, I’ll do that. My favorite thing to work on is science fiction, fantasy where you can create a new world, use your imagination to come up with new concepts. Kirill: You’ve worked on Underworld, I, Robot, Vanilla Sky, Godzilla and Total Recall. How involved are you as an art director in shaping these worlds? Oana: It depends on the designer you’re working with, how much input they’re looking for. It also depends on what stage they bring me in. As an art director, you’re the key assistant to the production designer. That’s your boss. Sometimes they want input, and sometimes they don’t. It has ranged in my past experience. I like to be involved from start to finish, to know that I’ve created something from beginning to end. Personally I’m interested in getting more production design jobs on my own so that I can have more creative contribution. Kirill: What are your thoughts in 3D movies, especially since you’ve mentioned your preference to work on sci-fi movies and the recent trend to shoot more of those in 3D? Oana: I actually haven’t worked on anything that was filmed in 3D yet, so I can’t speak to it from personal experience. I can just say that I loved Avatar and I thought it was completely revolutionary. When watching a film like that you can see the different levels and how important they are for foreground, midground and background objects. When you’re designing a space, you always want to keep that in mind because you’re designing for a camera and the shots. You want to always have something in the foreground that the camera can move through; it’s always very important as far as getting you into the story, making you feel like you’re in that space, as opposed to just a spectator. Kirill: Do you see production designers and art directors becoming more involved with the digital side of things on productions that build virtual worlds with virtual objects in them? Oana: Absolutely. Designers and art directors are already involved with the digital side of things, we are sought after for our aesthetic vision, whether that is for a virtual or practical environment. I don’t currently know how to program a computer to model a 3D object, that’s not my specialty. I know enough about the process to communicate with a modeler and give that person design direction. My specialty is my eye and my aesthetic – how do you place things in an environment. Maybe the person who does know how to model an object is not the person who has the eye to place it in space to make it a nice tableau. It’s about placement, textures, finishes, spacial relationships and storytelling. Kirill: What happens when you watch a movie in the theater? Do you get a chance to enjoy the story, or are you analyzing what your peers have done in that particular production? Oana: It depends on the movie. If it’s not very good, then I find myself analyzing a lot [laughs]. A compelling story is huge. If it’s not there to keep my interest, then I go into work mode and start analyzing the details in the environment and filming. Kirill: Any particular recommendations for movies that you’ve enjoyed over the years? Oana: Avatar again which I’ve mentioned. Fifth Element was gorgeous, and when it came out I wished I had worked on it. Other films I’ve really enjoyed include The Matrix, Terminator, Aliens, Amelie, Pan’s Labyrinth, 300, Blade Runner, Pulp Fiction, Beetlejuice, WALL-E, Eternal Sunshine of the Spotless Mind, Memento and Iron Man to name just a few. I recently saw Disconnected, a great film that has nothing to do with science fiction, it just had a very good story. And here I’d like to thank Oana Bogdan for this wonderful opportunity, and for sharing the on-set photos for the interview.